One of the peculiarities of the Valencia Denominación de Origen is its further division into four subzones: Alto Turia, Valentino, Moscatel de Valencia and Clariano. Perhaps the most distinctive in terms of both landscape and wines is the most southerly, Clariano, just the Valencia side of Alicante. 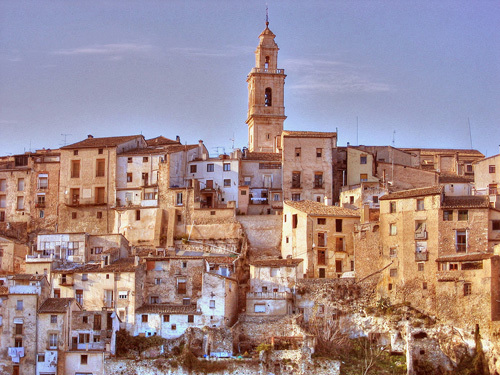 At the heart of this subzone is the Vall d’Albaida, a fertile high valley that runs from the arid central plane of La Mancha towards the Mediterranean, benefiting from both the dry westerly winds (“ponienteâ€) and the more humid easterly ones (“levanteâ€). At some 650 metres above sea level, this has always been a fertile high valley. Despite the low rainfall, the soil is rich. The “Alforinsâ€ in Fontantars dels Alforins derives from an Arabic word meaning abundant wheat. This area has established itself at the forefront of quality wines in the Comunitat Valenciana. In a triangle encompassing the villages of Moixent, Font de la Figuera, Fontanars dels Alforins out towards Ontinyent you’ll find a slew of bodegas doing good things. Heretat de Taverners, Los Frailes, J. Belda, Dominio Los Pinos, Celler del Roure, El Angosto, Torrevellisca, La Viña de la Font de La Figuera Cooperativa, Pago Casa Gran, among others. Here the traditional red variety is Monastrell, and this variety remains at the core of much that is being done, but the locality has embraced experimentation. Alongside renewed enthusiasm for previously neglected local varieties such as Garnacha Tintorera, there is Tempranillo, Cabernet Sauvignon, Merlot, Chardonnay, Sauvignon Blanc and more.Â Heretat de Taverners are delighted with their Graciano, the most southerly wine made from this generally unsung Rioja grape. Los Frailes bases its wines on Monastrell (“Bilogía is 50% Monastrell and 50% Tempranillio, “Trilogíaâ€ is 70% Monastrell, 20% Tempranillo and 10% Cabernet Sauvignos), but the bodega recently launched MOMA, an equal blend of Monastrell and the hybrid Marselan for which they have high hopes. The area has come a long way since Manuel Olaechea of Dominio Los Pinos told me that when he planted his international varieties Viognier, Muscat Ã Petits Grains, Sauvignon Blanc, etc.) in the early 90s he was regarded as peculiar by the locals and ostracized by the authorities. In fact he was instrumental in showing the possibilities for quality wine in this privileged location, and he also blazed the trail for organic wines, based on the fact that the climate is particularly effective in minimizing pests, so that very few chemicals are needed, anyway. The Los Frailes wines are also organic, and these are wines that have gone this route the better to cultivate the land and make their wines, not merely to capture a niche market. Los Frailes has added a state of the art modern wing and visitors centre to the grand eighteenth-century house. The celebrated Celler del Roure has moved from a garage-style production to a brand new bodega. El Angosto has recently added wine to a broader spread of agricultural activities and the great old house is full of ancient farming implements – very much of the earth rather than the laboratory. The humble-sounding Cooperativa Vinícola La Viña just had its Cabernet Sauvigno/Tempranillo blend (marketed as El Molinet in the USA and Casa l’Angel in Spain) named by “Decanterâ€ as one of the “ten best Spanish new wave winesâ€. Daniel Belda has been mentioned before on these pages as the rescuer of Verdil, with Torrevellisca following his lead with their own Verdil monovarietal, but he has also explored many other viticultural and commercial possibilities. One of the latest latest is myWine, which allows you to make your own wine, from pruning the vines and harvesting to the bottling and labelling, choosing your wine variety and working under the guidance of specialist winemakers. Total cost over for two people is 6,517.24 euros plus VAT in 18 monthly instalments. I’m saving up already. Have a look at the website for more information, but also for an image that conveys how attractive this part of the country is. Then come down here for a day or two and visit some or all of these bodegas, who have been wonderfully hospitable whenever I’ve been lucky enough to come. Fontanars also boasts a restaurant with quite a reputation, Casa Julio.